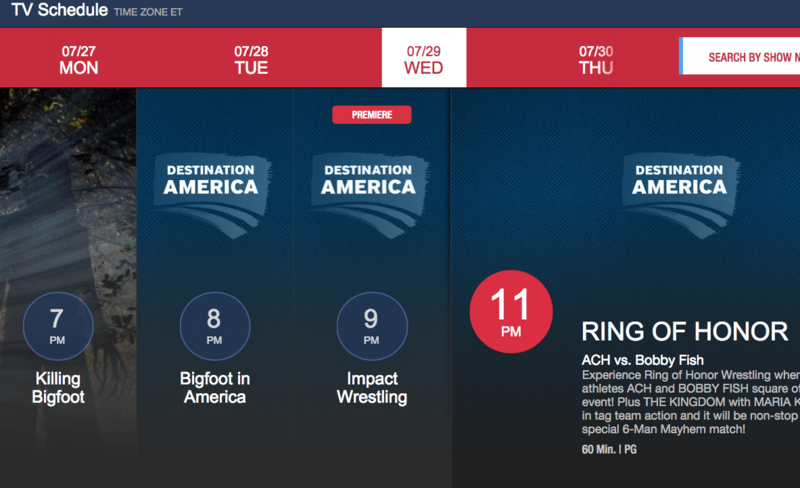 Ring of Honor has been bumped from Destination America's prime time cable TV line-up after eight weeks. Dest. America has not said whether this is a permanent move, but ROH is not scheduled for the 8:00 p.m. EST timeslot for at least the next two weeks, according to Dest. America's official line-up. TNA Impact is still at 9:00 p.m. for two hours, followed by the weekly ROH TV episode at 11:00 p.m. EST. Dest. America previously aired an ROH replay in the 11:00 timeslot. The Impact replay will continue airing at 12:00 midnight after ROH. In ROH's place on Wednesday, July 29 is the premiere episode of "Bigfoot in America." Next Wednesday, August 5, Dest. America is airing a "Mountain Monsters" marathon leading into Impact. - In June, Dest. America announced a 26-episode order of ROH TV deal as part of a distribution deal with ROH's parent company, Sinclair Broadcasting. The series is scheduled to run through the end of the year, but this scheduling move brings up questions about ROH's future on the cable channel. ROH started off strong through the first four episodes, peaking with a combined audience of 330,000 viewers on June 24. However, ROH fell to 238,000 combined viewers on July 1, then bottomed out with 169,000 viewers on July 15. ROH rebounded to 265,000 viewers for the most-recent episode airing on July 22. Notably, the July 15 and 22 episodes did not place in the weekly cable TV rankings. ROH, like TNA Impact, has struggled to draw a broad audience. ROH is within Dest. America's 25-54-year-old demographic window, but draws a small percentage of female viewers. ROH's split through eight episodes is 80 percent m18-49 vs. 19 percent f18-49 (with a slight rounding discrepancy). TNA's split on Wednesday nights is very similar at 81 percent m18-49 vs. 19 percent f18-49.